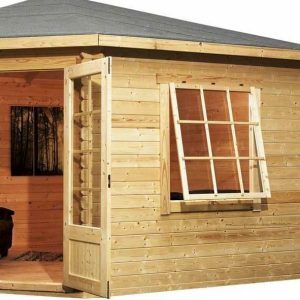 The magnificent 4×4 Waltons Lodge Corner Log Cabin is a beautiful addition to any garden. 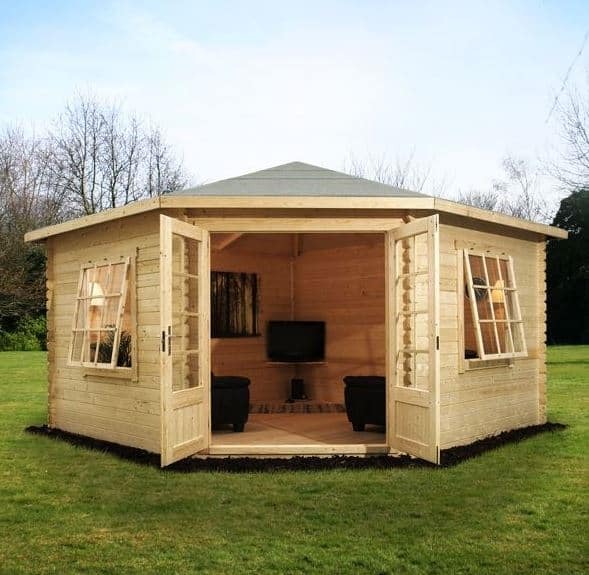 Designed with space saving in mind, this cabin can be used for a number of different purposes but would be especially great as an additional living room or relaxation space. 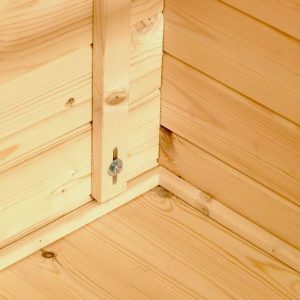 Though it comes with thick 28mm timber log cladding, upgrades are available. You can also upgrade the windows from single to double glazing if preferred. Large extra-wide double doors provide one of the main focal points of the building. They also come with a glazed design to increase the amount of lighting that enters the cabin. A heavy duty mineral felt comes supplied to protect the apex roof, but upgrades are available to increase its weatherproof capabilities. The shingles add a particularly attractive design and are well worth the additional upgrade cost. It isn’t just the outside of the cabin that benefits from thick tongue and groove construction. Inside you will also find 19mm thick tongue and groove on the roof and floor. So adding heavy furniture or equipment is no problem for this tough, rigid cabin. So if you’re searching for a compact cabin that won’t take up too much space, this is a fantastic choice. All upgrades available will add a significant amount onto the total. However, the high cost of the cabin is definitely worth the overall value you receive. 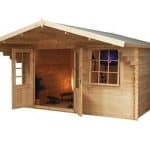 T his is one of the smaller log cabins available, though it still provides a generous interior which can be used for a number of purposes. 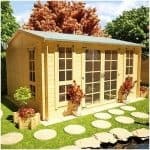 Its unusual corner design makes it ideal for gardens which have space limitations. 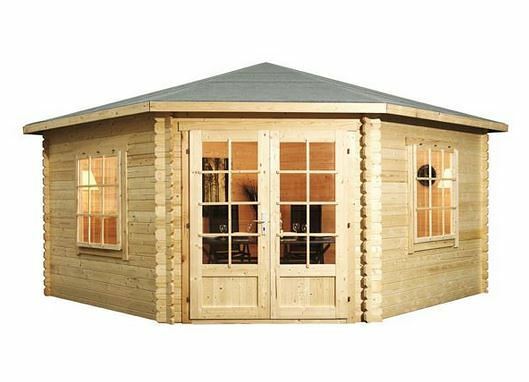 The apex roof also has a very unusual style compared to other cabins and it certainly isn’t a traditional apex design. 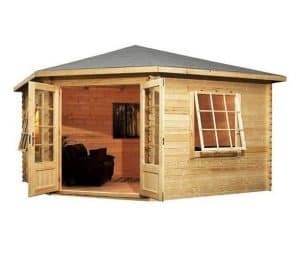 Whilst it could be used as a home office, it has more of a cosy retreat design so would make an ideal place to relax and unwind after a long hard day. Though the width and depth of this cabin is designed with space saving in mind, the height is impressive. It is one of the taller cabins available and that is all thanks to the uniquely shaped apex roof. It doesn’t matter how tall you are, you won’t have any issues walking around with your head high in this building. The doors are also really wide in order to ensure you can get literally anything inside. You’ll see that the cabin has more of a hexagon shape compared to its competitors. 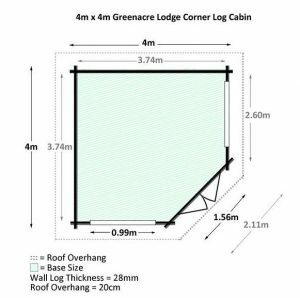 This is to ensure it neatly fits into the corner of the garden, whilst also providing a cabin that is packed full of character. One of the most striking things about this cabin is the individually designed apex roof. With an apex design you tend to think of the common, more traditional upside down V shape. This one however has more of a hexagon design. So the roof appears to have five different sections, each providing a sharp slope for rainwater to run down and drain off. It is supplied with a heavy duty mineral felt. Now compared to a lot of felts provided by manufacturers, this one does offer slightly thicker and longer lasting results. However, we do think you should seriously consider the two upgrade options available. Superior duty felt and shingles are available and you can find out more about these two upgrades in the Customisation Options part of the review. 19mm tongue and groove is used to create both the roof and the floor. This is an exceptional thick and strong design that ensures the cabin is not only sturdy, but that it can also store heavy furniture and equipment. 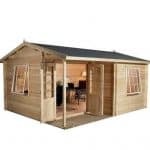 This cabin is very similar to a lot of others offered by Waltons in the fact that it comes with three cladding options. The first, which is included in the cost, is the 28mm thick cladding. 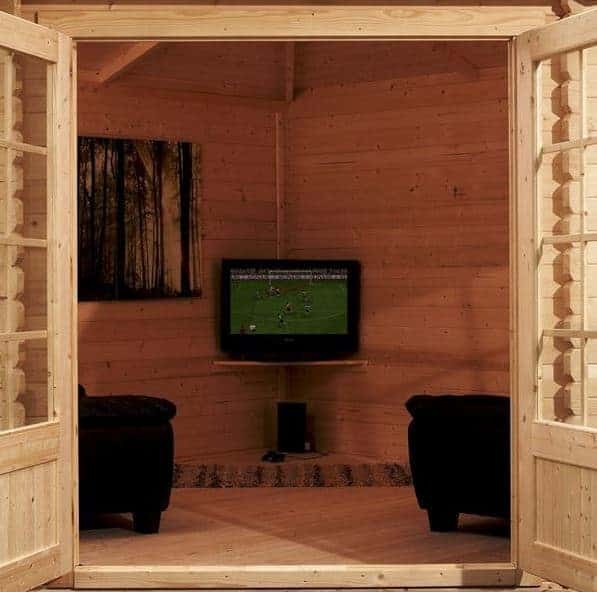 Created from superb quality pine, the walls have a chic, traditional light coloured design with unique chalet joints corner connections added to the exterior. These connections provide the building with a lot more rigidity and strength. It is also possible to upgrade to 34mm and 44mm thick logs. Obviously the thicker the cladding, the warmer the cabin will be and the sturdier it will be too. The 44mm option also comes with an exceptional double wind tunnel built in. This basically ensures there are no drafts within the cabins interior. As we’d expect from a thick clad cabin, the interior benefits from very sturdy framing. There are also roof joists added to provide maximum support for the roof. So the manufacturer hasn’t just focused on creating a high quality exterior; they have also ensured the inside of the cabin maintains the same high standards. It doesn’t matter which cladding thickness you opt for, they all require the same treatment applications. Waltons state that a high quality treatment will need to be applied to the timber after the cabin has been constructed. They don’t give any further advice on this, but typically you need to re-apply treatments annually. So what is a high quality treatment? Well for best results we’d suggest using a spirit treatment. These work into the very depths of the timber, rather than just coating the surface. Actually, if you use a spirit treatment you could limit the re-applications to every couple of years, rather than every year. So whilst they are more expensive to purchase than water treatments, in the long run they are more cost effective due to the longer length of protection provided. Due to the corner design, the double doors of this cabin are situated at an angle. They have been constructed with an ultra-wide design and benefit from the same aesthetically pleasing panelled style as the windows. 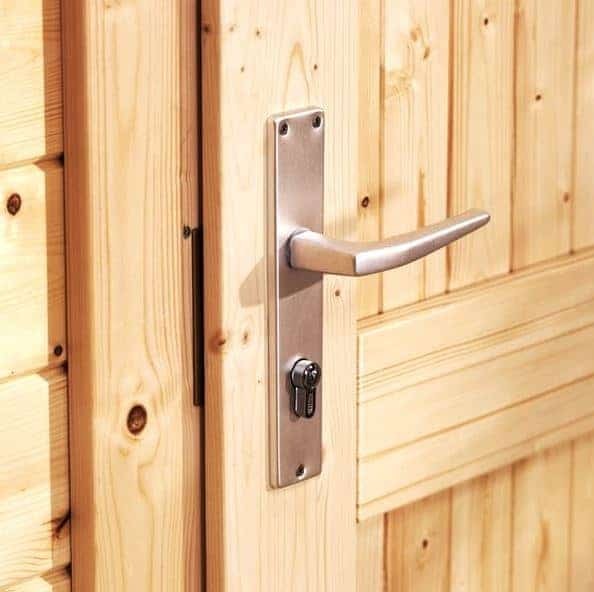 In order to make sure they are secure, a mortice lock has been installed which can be accessed via a key. There are two large panelled single glazed windows. The glazing included measures 4mm thick, but you can upgrade to 16mm double glazing. These windows can be opened so you are guaranteed to be comfortable in the hotter months. It will also help to air out the cabin to avoid potential problems with moisture. 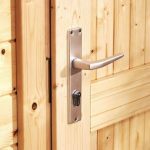 The cabin isn’t just structurally secure, the mortice lock and key also adds an outstanding level of security to ensure it cannot be easily broken into. There isn’t anything you need to do to improve the building’s security. However, if you are concerned or you live in a vulnerable area you could always buy an alarm system. The windows on the cabin are pretty large so you won’t get much privacy. However, we would suggest the installation of blinds, curtains or netting to improve this. It’s great that Waltons give you three different customisation options. 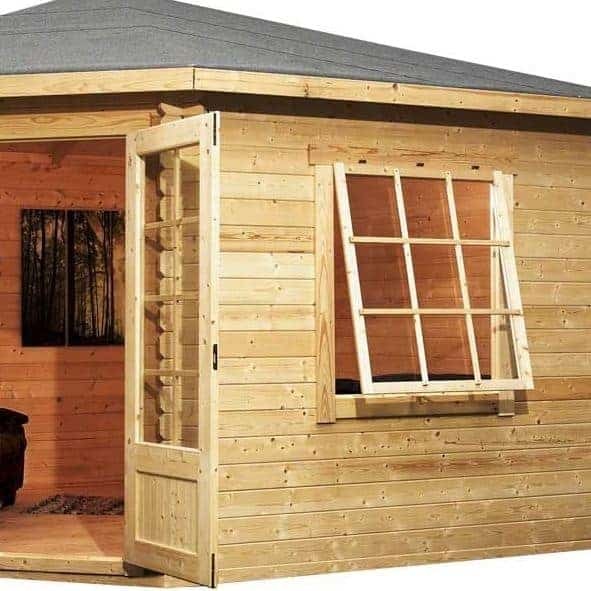 All of them will help you to get the most out of this little cabin, but some do come with a pretty hefty price tag so this is something you need to be aware of. The cladding thickness is your first customisation option available. As mentioned you have three options. Choose to stick with the 28mm thick walls or upgrade to either 34mm or 44mm. So what are the benefits of upgrading? Well with the 34mm thick walls, you’re getting a thicker, stronger, more insulated cladding. It will also help to enhance the security of the cabin as it will be near impossible to break through. The biggest benefits come with the thickest 44mm cladding however. Unlike the other two options, the 44mm thick walls come with a double wind tunnel. This ensures that even in the strongest winds, no drafts will filter through to the interior. If you do decide to go ahead with the 44mm option, it will also eliminate the need for insulation. Your next decision is whether you want to stick with the 4mm single glazing, or upgrade to the 16mm double glazing. Again, the thicker glazing will provide more insulation, but that isn’t the only benefit you’ll receive. It also reduces noise pollution, providing you with a much more relaxing space. Then there’s the further benefit of the thicker glazing being more difficult to break. So you’re looking at improved security, comfort and a lot more peace and quiet if you do upgrade. Last but not least you are able to customise the roofing felt. Now the heavy duty felt isn’t bad, but when you’re spending so much money on a cabin, it makes sense to ensure every part of it benefits from the very best quality. There are two additional roofing options available. The first and the least expensive is the Superior Duty felt. This is a lot thicker than the heavy duty mineral felt and it is created from fibreglass. So what this means is that it will not perish no matter what elements it is exposed to. You can stick with a traditional charcoal colour or opt for a slightly more colourful olive green. If you want to really enhance the roof however, we highly recommend the shingles. ArmourShield Shingles are self-adhesive and they look and feel just like traditional roofing tiles. They offer an outstanding barrier against water and best of all, they look fantastic. As you can see most of the roof, this upgrade is well worth the additional cost. The shingles are technologically advanced and they have a very distinctive look that will give the cabin a more fashionable design. There are three extras available with this cabin and as you’ll see, they are pretty expensive. We’ll start with the one we feel is the most essential – the Waltons Home Installation Service 360. This may not be a huge cabin, but it does come with a unique design. Assembling it yourself is possible, but it will take a lot of hard work and take up a lot of time. Therefore we feel that despite the high cost, if you can afford the installation service then it would definitely give you good value for money. You will need to prepare a solid, even base before the team arrive. 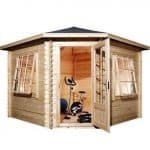 However, once the base is taken care of you simply need to sit back and watch as the professionals unpack the cabin, put it together and then tidy up after themselves. This installation service will also ensure that the cabin is put together correctly and safely. They even attach the felt, though if you choose to upgrade to the shingles they will not be included in the installation service. 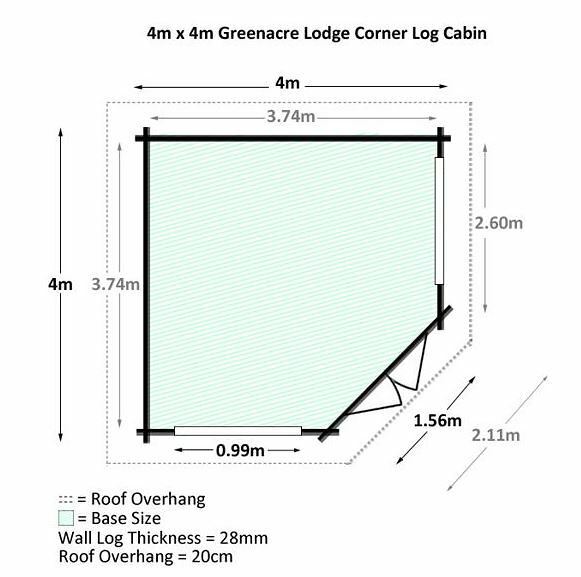 EcoQuilt insulation kits could be useful if you plan on using the cabin all year round. They come in two different sizes, with the 60 square metre kit offering the most insulation. Both feature six layers of thermal wadding and a reflective foil layer to protect against moisture. They can be used on the roof, walls or floor and will help to keep the cabin warmer in winter and cooler in summer. Both kits are easy to install and come with everything you need to fit them. Finally you have the solar panel kits. They offer a more environmentally friendly way of getting light and power into the cabin than an electrical pack. However, as you will see the cost of them is extremely high, even for the lowest powered option. There are roof mounted and free standing kits available. It’s important to think about how many things will need to be powered at the same time before choosing the right kit to fit your requirements. One of the benefits of these solar panels is that you only need to pay the upfront purchase cost. After they have been installed, they don’t use mains electricity so you will benefit from free power. The solar panels charge up throughout the day via the rays of the sun and that’s where the energy comes from. It doesn’t matter what you are planning on using the cabin for, it is highly likely you will need power. Just like other cabins in the Waltons collection, this one is made to an exceptional high standard. Every little detail has been created with quality in mind. It is a solid, secure building with a uniquely attractive design. The only thing to be aware of in terms of longevity is that the cabin does need to be treated after assembly. Treatments will then need to be reapplied in accordance with the manufacturer’s instructions. Provided you do this, the cabin is going to last for a very long time to come. Despite its compact measurements, this cabin provides a surprising level of interior space. This is largely thanks to the hexagon shape. It maximises the amount of space inside the cabin and ensures you can fit a sofa and other large items inside the building. Some customers have found that the instructions aren’t overly easy to understand. It will take quite a while to familiarise yourself with them, not to mention leaving a couple of days to put the cabin together. We would recommend using the installation service if you can afford it. We’re actually surprised by the reasonable price of this cabin, though it is disappointing that the customisation options and extras will push the cost right up. 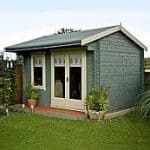 If you’re looking for a compact building that will fit into the corner of your garden however, this is one of the best value for money models out there. 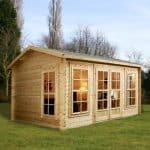 Final Thoughts: The space saving, compact corner log cabin from Waltons comes with a range of great benefits. Aesthetically, the unique apex roof, corner joints chalet connections and panelled windows really help to give the building character. It is built from tough materials and the upgrades on offer can really help to enhance the cabin and make it suitable for year-round use. The wide double doors are kept secure through a key operated lock, adding great security to the building. 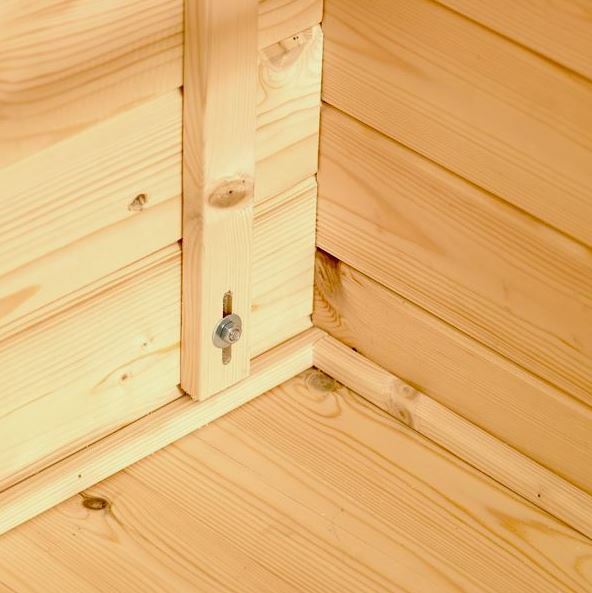 We also really like the little details included in the cabin’s design such as the tough floor bearers and roof joists, helping to really boost its stability.